another bastion of the Irish community since the 1870’s. various European nations including the Irish, Scots and the British. Montreal. Address: 1558 Avenue of the Church. The registers of this parish opened in the year 1874, date of the arrival of the first resident parish priest. Canonical Erection: December 10, 1875. Civil Erection: December 24, 1875. The territory of this parish has been detached from the parishes of Saint-Henri-des-Tanneries , Saint-Pierre River and Côte Saint-Paul. The parish was put under the patronage of St. Paul probably because of its neighborhood with the parish of Notre-Dame-des-Sept-Douleurs-de-Verdun , formerly known as "Village of the Saint-Pierre River". (1879) – Rev. M. Campion, Rev. P.F. O’Donnell, presiding. This Irish church was somehow associated with Saint Bridget, another parish of the same district of Faubourg Quebec. Our Lady of Good Counsel was located at the corner of Craig (St-Antoine) and Panet Streets. 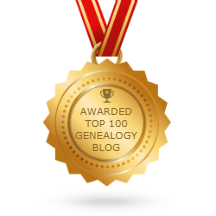 At the Archives, the church records can be found under Notre Dame du Bon Conseil. 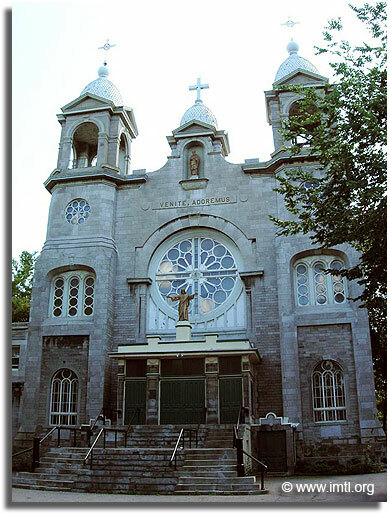 The parish of Notre-Dame-du-Bon-Conseil was first erected under the name of "Sainte-Marie-de-Montréal", for the English-speaking Catholics of the parishes of St. Bridget , St. Vincent de-Paul , Saint-Eusebe , Saint-Pierre and part of Sainte-Catherine. The registers of the parish opened in the year 1881. Canonical erection: December 20, 1879. The canonical decree erecting this parish was published in the Official Gazette. On the occasion of the blessing of the church, the parish was put under the patronage of Notre-Dame-du-Bon- Advice. Today it includes English-speaking Catholics from the parishes of St. Bridget , St. Eusebius , St. Peter and St. Vincent de Paul. Pop. 2,255. The parish closed in 1984, and the church was demolished. On 15 April 2019, shortly before 18:50 CEST, a fire broke out in the roof of Notre Dame Cathedral in Paris, France, causing significant damage to the building. The fire lasted more than twelve hours, but was fully extinguished the following day. Fire crews remained to identify and extinguish residual fires. The cathedral's spire and roof collapsed, and considerable damage was sustained to the interior, upper walls, and windows of the church, as well as numerous works of art and the pipe organ.The stone ceiling vault beneath the roof prevented most of the fire from falling into the interior of the cathedral below. The Church of St. Michael and St. Anthony is a Roman Catholic church located in Mile End, Montreal. It was originally built as the Church of St. Michael and frequented by Irish Catholics. Because of the growth of the Polish community in the area, in 1964 a Polish mission was inaugurated in the church and the church's name was expanded to "St. Michael and St. Anthony". 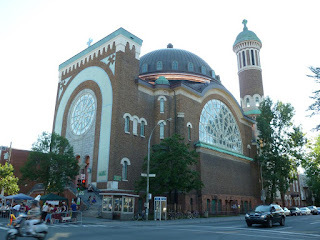 The church exemplifies cultural hybridity, being a Byzantine-styled church, built for Irish Catholics, in a multicultural neighbourhood, and being home today to mostly Poles and Italians. 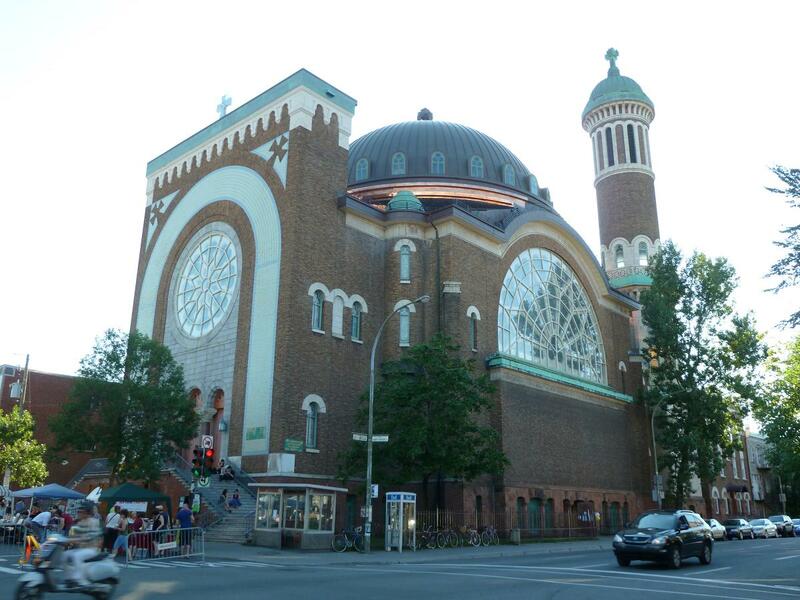 The church has also been noted for its Byzantine Revival architecture, complete with a dome and minaret-styled tower, making it "one of the more unique examples of church architecture in Montréal. 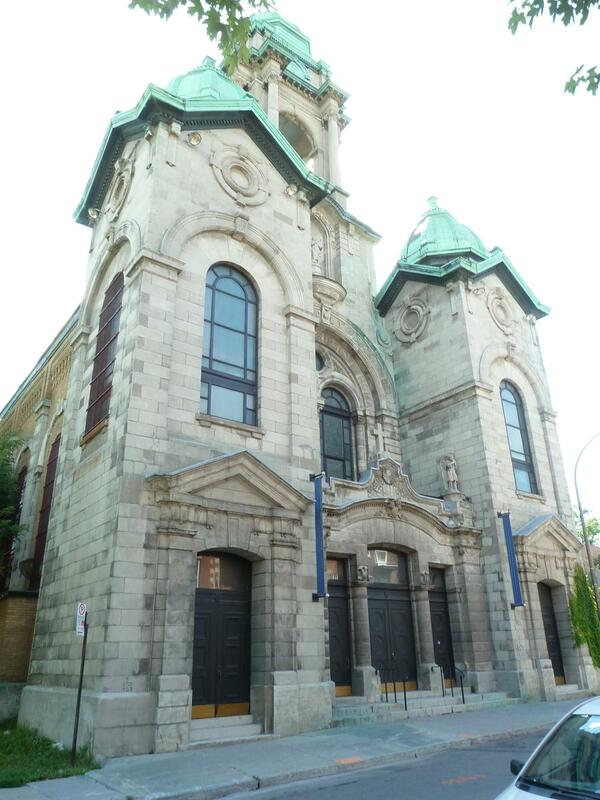 Construction on the Church of St. Michael the Archangel began in 1914, for what would grow to become the largest anglophone parish in Montreal. After a brief delay following the commencement of World War I, the church was completed in 1915 at a cost of $232,000, with a capacity of 1,400 people. Though Mile End was originally a predominately Irish neighbourhood, the Polish community grew such that the two communities "merged into one", and to reflect this change, St. Anthony was appended to the parish name, reflecting the "Conventual Franciscans' devotion to St. Anthony of Padua." Today, the church is recognised as the focal point for the Polish Catholics of Montreal. The church was built in the Neo-Byzantine style of architecture, accompanied by a large turquoise dome and minaret-style tower. It was designed by architect Aristide Beaugrand-Champagne [fr] (1876–1950), who was inspired by the Hagia Sophia (originally an Orthodox basilica) in Istanbul (formerly Constantinople). The church also features elements of Gothic and Roman architecture, as well as lombard bands and window tracery reminiscent of Middle Ages castles. The church's dome features one of the first uses of reinforced concrete in Quebec. The interior roof of the dome features a neo-Renaissance-style fresco of St. Michael watching the fall of the angels, painted by Italian Guido Nincheri, who painted other churches in Montreal. My maternal grandmother, Bertha Burns Bernard had her funeral service at Saint Michael the Archangel in September of 1955 and then interred at Cote de Neige Cemetery. Bertha was born in 1892 in Quebec City to George Burns and Elizabeth Williamson, the youngest of four children, the others being Albert, William, and Ethel. 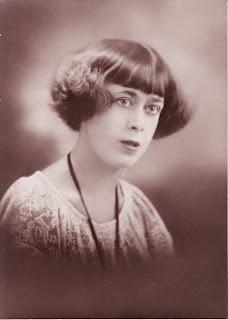 She and her mother, Elizabeth moved to Mile End in Montreal around 1920 after the death of her father George. 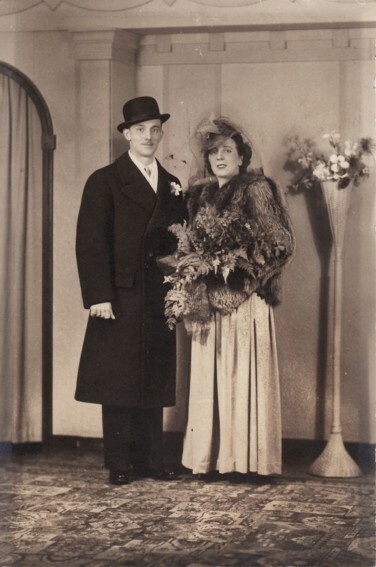 Bertha married Ovila Bernard in 1925 and they had four children, Norman, Pauline, George, and Lorne. Bertha only had two grandchildren as Norman and George died young and never married. She never knew her only grandson as he was born 9 years after her death. She was able to enjoy her only grand-daughter for four years, it would have to be enough as fate took the child to the United States and Bertha would die under mysterious circumstances three years later. The registers of this parish opened in the year 1901, date of the appointment of the first resident parish priest. The church is built on Western Avenue, between Redfern and Clarke Streets. Part of Sainte-Cunegonde annexed in 1904. 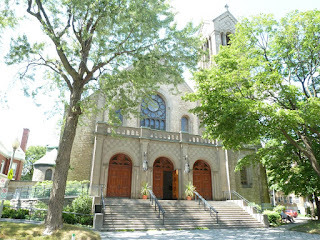 The territory of this parish is included in the city of Westmount. 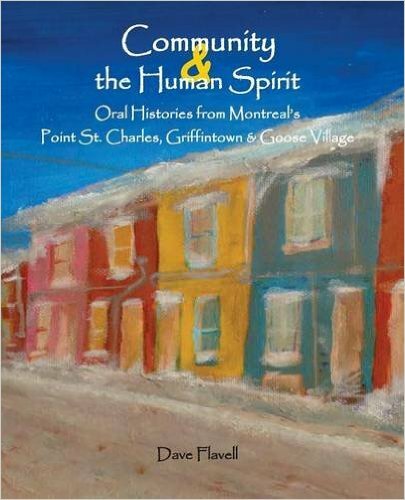 It includes part of the parishes of Notre-Dame-de-Grâce , Sainte-Élisabeth , Saint-Henri, Notre-Dame-de-Montréal, Sainte-Cunegonde and Saint-Jacques-le-Majeur . The city of Westmount is located west of the mountain of Montreal; hence the name "Westmount". The erection of the parish was decided in the year of the jubilee ordained by His Holiness Pope Leo XIII, in 1900. Hence the choice of St. Leo the First as titular. Pop. 4,000. 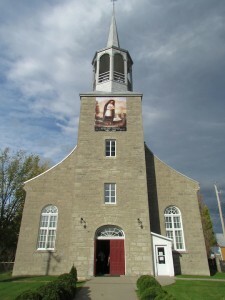 The Church of Saint-Léon-de-Westmount was designated a national historic site of Canada in 1997.